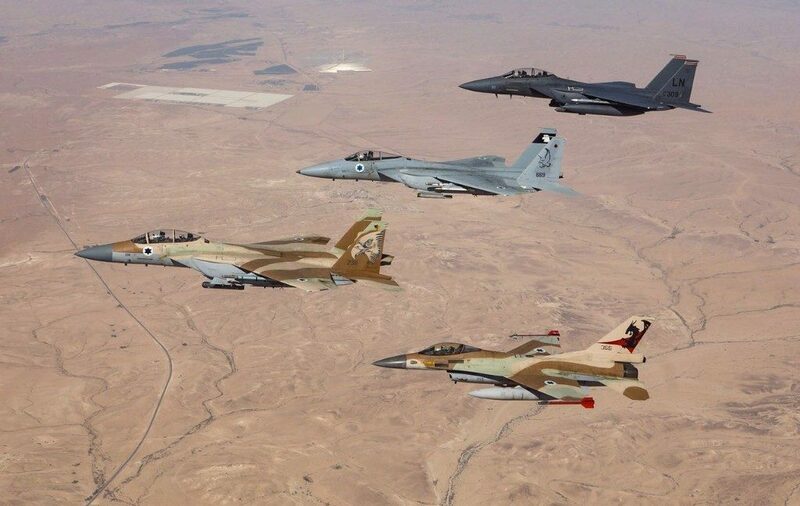 Despite the shock which accompanied it, there was an inevitability to the confrontation between Israel and Iran which took place over the skies of Syria and northern Israel last weekend. This may, moreover, be simply a harbinger of more – and worse – to come. On Saturday morning, Israeli forces intercepted and destroyed an Iranian drone, which had been launched from Palmyra in eastern Syria, after it entered Israeli airspace in the Beit Shean Valley. Shortly afterwards, Israeli jets attacked Iranian targets in Syria, focusing on the command and control centre from which the drone had been dispatched. A returning Israeli jet was then downed by Syrian anti-aircraft fire. The crew, who had reached Israeli territory, safely ejected from the aircraft. In retaliation for the attack on its aircraft, Israel launched a series of airstrikes against Syrian aerial defence systems, as well as further Iranian targets. In all, it is reported that Israel hit 12 targets in Syria, four of which are Iranian sites. Anti-aircraft fire was again launched at Israeli planes, sirens sounded in northern Israel and flights were grounded for a short period at Ben Gurion airport near Tel Aviv while the security situation was assessed. Iranian and Syrian troops were reportedly killed in the Israeli strikes. The attack heralded a new, and potentially more dangerous, turn of events in what has been described as a long-simmering “campaign between wars” between Israel, Iran and the Islamic republic’s proxy army, Hezbollah. Iran and Hezbollah have played a critical part in assisting President Assad defeat rebel forces during Syria’s bloody seven-year civil war. Both Iran and Israel have claimed victories of sorts. Iran and Syria point to the fact that an Israeli air force jet had been downed for the first time since the 1982 Lebanon war. Israel says that its airstrikes in Syria were the “biggest and most significant” since the 1982 war. Israel has also signalled to Assad the large-scale damage on his military that it could potentially inflict if he does not try to restrain the Iranians. The scale of the Israeli effort should not be under-estimated, with an IDF spokesman indicating that “between a third and a half” of Syria’s air defences may have been destroyed. Of course, last weekend’s events were not simply about an Iranian drone in Israeli airspace. Given its repeated threats to annihilate the Jewish state, Israel has long been justifiably wary of Iran. Those fears, though, have been heightened in recent years by Iranian expansionism in the region in general – analysts have identified an “arc of influence” connecting Tehran to the Mediterranean Sea and the border with Israel – and the ayatollahs’ growing sway in Syria in particular. According to Israeli intelligence Iran has 82,000 fighters under its control in Syria. Israeli satellite pictures published last December suggest it is building a military base in Syria, just 31 miles from Israel’s northern border. Israel has also identified a site it claims Iran is constructing to build precision-guided missiles. Israel thus believes it is vitally important that it prevents Iran, Hezbollah and other assorted Shiite militias from menacing it with rockets in Syria or with artillery and troops just beyond the Golan Heights. Publicly, Israel has made clear its intention – by military means if necessary – to maintain its “red lines” in Syria. Key among these is that it will not allow attempts to manufacture and transport “game-changing” weapons to Hezbollah (which, thanks to Iran, has an estimated 140,000 missiles pointing at Israel). While Saturday’s strikes were the first time Israel has publicly acknowledged its actions in Syria, the outgoing head of the Israeli air force last year stated that Israel had conducted approximately 100 airstrikes inside Syria in order to uphold these red lines in recent years. Last week, for instance, it is thought Israel carried out a strike on a facility in the Damascus suburbs which is believed to manufacture chemical weapons and assist Iran and Hezbollah in improving their missile technology. Israel has also sought to establish a buffer zone around the southwestern border where Hezbollah and other Iranian-backed militia would not be allowed to operate. A new report from the International Crisis Group think-tank, however, cautions that this buffer zone is hardly impermeable, noting that these groups can easily frustrate Israel’s aims by “for instance integrating the fighters into the Syrian army or simply having them don its uniforms”. Under both Presidents Obama and Trump, the US has been disengaged from events in Syria that do not directly impact upon the fight against IS. However, since September 2015, when it began giving significant support to its long-time ally, Assad, Russia has been anything but disengaged in Syria. Eager to avoid becoming involved in any direct confrontation, Israel and Russia have established a hotline and remained in close contact with one another. Benjamin Netanyahu spoke with President Vladimir Putin by phone on Saturday morning shortly after the airstrikes. The Israeli prime minister has been attempting for some time to build a relationship with Putin in order to splinter the relationship between Iran and Russia. While Israel and Russia have as yet not come to blows in Syria, the degree to which Netanyahu’s strategy is working is open to question. As the Washington Post noted: “Russian forces … were almost certainly complicit bystanders in Syria’s shadow war with Israel.” Thus one of the Syrian bases Israel hit on Saturday is home to both Syrian soldiers and Russian military officers. Defence analysts also believe that fighting alongside Russian forces has helped Hezbollah evolve into a more effective army with better tactics, strategies and weapons. One potential opportunity for Israel rests in the fact that, as their common goal of securing Assad in power comes closer to being realised, the commonality of interests between Russia, Iran and Syria will begin to weaken. Russia, for instance, wishes to consolidate its new-found superpower status in the region by avoiding destabilising events, such as an all-out war between Israel and Hezbollah. Russia is also keen to bolster Assad. Iran wishes to keep the Syrian dictator in power, but would probably prefer to see him dependent on some form of Lebanon-style coalition which it can influence through its proxy armies and allies. Iran’s desire to retain its “arc of influence” and bolster Hezbollah in its war against Israel is, however, matched only by the Jewish state’s determination to prevent it. Those two competing aims mean clashes like those which occurred last weekend are unlikely to be the last.